Endocannabinoid (eCB)-mediated forms of long-term synaptic plasticity occur in several brain regions, but much remains unknown about their basic properties and underlying mechanisms. Here, we present evidence that eCB-mediated long-term depression (eCB-LTD) at excitatory synapses on medium spiny neurons in the striatum requires presynaptic activity coincident with CB1 receptor activation. This dual requirement for CB1 activation and presynaptic activity is a mechanism by which eCB-LTD may be made synapse specific. Synapse specificity is considered a key feature of all forms of Hebbian synaptic plasticity and has important functional and computational implications (Brown et al., 1990). For traditional NMDA receptor-dependent forms of long-term potentiation and long-term depression (LTD), synapse specificity is likely achieved by biochemical compartmentalization within individual dendritic spines (Harris and Kater, 1994; Yuste et al., 2000). Recently, endocannabinoid (eCB)-mediated forms of long-term synaptic plasticity have been identified in many brain regions, including the hippocampus, striatum, cortex, cerebellum, and amygdala (Chevaleyre et al., 2006). All of these involve the postsynaptic release of an eCB, which functions as a diffusible retrograde messenger that causes a long-lasting, presynaptic depression of transmitter release. Although the Ca2+ influx causing release of eCBs can be spatially restricted postsynaptically to active dendritic regions (Brown et al., 2003; Soler-Llavina and Sabatini, 2006), these diffusible messengers nevertheless have been shown to elicit a heterosynaptic depression by activating CB1 receptors at presynaptic terminals that were not involved in the triggering of eCB release (Chevaleyre and Castillo, 2004). These results suggest that eCBs can spill over into synapses adjacent to their site of release and potentially cause a nonspecific depression of these inactive synapses. In this study, we have addressed whether additional presynaptic mechanisms exist to ensure the synapse specificity of eCB-LTD in the dorsal striatum. We present evidence for such a mechanism, specifically that LTD induction requires low-frequency presynaptic activity coincident with presynaptic CB1 receptor activation. Coronal slices (300 μm thickness) containing dorsal striatum were prepared from brains of 21- to 26-d-old Sprague Dawley rats. Slices were stored at room temperature in external solution containing the following (in mm): 125 NaCl, 2.5 KCl, 2 CaCl2, 1 MgCl2, 26 NaHCO3, 1.25 NaH2PO4, and 16.6 glucose and bubbled with 95% CO2/5% O2 (308–310 mOsm). After recovery for 1–4 h, experiments were performed on slices perfused with external solution containing 50 μm picrotoxin to block GABAA receptor-mediated currents. All experiments were performed at room temperature, except those in -Figure 2, A and B, which were performed at 30–32°C. Whole-cell voltage-clamp recordings from medium spiny neurons in dorsolateral striatum were obtained under visual control using infrared-differential interference contrast microscopy as described previously (Kreitzer and Malenka, 2005). Briefly, medium spiny neurons, which constitute >90% of neurons in the striatum (Kawaguchi, 1997), were visually identified by their medium size and flat, circular shape and confirmed to be medium spiny neurons electrophysiologically by the biexponential decay kinetics of capacitance transients, hyperpolarized resting membrane potential measured immediately after break-in (more hyperpolarized than −70 mV) (Jiang and North, 1991), and EPSC decay time constants of 4–5 ms. For all experiments except those in Figure 4B, whole-cell electrodes (2–4 MΩ) were filled with internal solution containing the following (in mm): 120 CsMeSO3, 15 CsCl, 8 NaCl, 0.2 EGTA, 10 HEPES, 2 Mg-ATP, 0.3 Na-GTP, 10 tetraethylammonium, and 5 QX-314 [5-N-(2,6-dimethylphenylcarbamoylmethyl)triethylammonium bromide] (308–310 mOsm). pH was adjusted to 7.3 with CsOH. For experiments in Figure 4B, whole-cell electrodes were filled with the same internal solution, except that EGTA was omitted and 10–20 mm Cs-BAPTA and 70–80 mm CsMeSO3 were used. R-(+)-(2,3-dihydro-5-methyl-3-[(4-morpholinyl)methyl]pyrol[1,2,3-de]-1,4-benzoxazin-6-yl)(1-naphthalenyl) methanone monomethanesulfonate [WIN55,212-2 (WIN)] was not applied until 25–30 min after break-in. Synaptic currents were evoked using stainless-steel bipolar stimulating electrodes placed within the striatum, ∼200–300 μm from the cell body. In all experiments, baseline synaptic currents were evoked at 0.05 Hz with two monopolar square pulses (pulse width, 50 μs; interstimulus interval, 50 ms) while holding the cell at −70 mV. For two-pathway experiments, the independence of the two pathways was confirmed by alternately stimulating the two pathways with an interstimulus interval of 50 ms and observing the lack of paired-pulse facilitation or depression that was present when a single pathway was stimulated with paired pulses separated by 50 ms. Miniature EPSCs (mEPSCs) were recorded in 1 μm tetrodotoxin (TTX). Access and input resistances were continuously monitored on-line, and experiments were excluded if these values changed by more than ∼15%. Data were acquired with an Axopatch 4D amplifier, filtered at 2 kHz, and digitized at 5 kHz. Custom software (Igor Pro) was used for on-line data acquisition and analyses. In all summary graphs, each symbol represents the mean ± SEM. Statistical significance was determined using Student's t test. For each individual two-pathway experiment, EPSCs were normalized to their respective 10 min baselines. A paired t test was then used to assess statistical significance across all experiments by comparing EPSCs in the pathway that received stimulation to the EPSCs in the pathway that did not receive stimulation (using the final 10 min of each experiment). All drugs were made as concentrated stock solutions and diluted in ACSF to their test concentrations. Drugs were from Tocris Bioscience (Ellisville, MO) [WIN55,212-2, N-1-(2,4-dichlorophenyl)-5-(4-iodophenyl)-4-methyl-N-1-piperidinyl-1H-pyrazole-3-carboxamide (AM251), and (2S)-2-amino-2-[(1S,2S)-2-carboxycycloprop-1-yl]-3-(xanth-9-yl) propanoic acid (LY341495)], Sigma (St. Louis, MO) (kynurenic acid, tetrodotoxin, and picrotoxin), or Invitrogen (Carlsbad, CA) (BAPTA). NaOH (1 eq) was used to solubilize kynurenic acid in its stock solution. In all experiments, WIN was used at 1 μm, and AM251 was used at 5 μm. It has been reported that directly activating CB1 receptors with the agonist WIN is sufficient to induce eCB-LTD at excitatory synapses on striatal medium spiny neurons (Kreitzer and Malenka, 2005). We examined whether this LTD requires synaptic activity by performing two-pathway experiments during which two independent sets of synapses on the recorded cell are alternatively stimulated. During the 10 min WIN application, one pathway received stimulation (1 Hz for 5 min) while stimulation of the other pathway was stopped both during WIN application and its wash-out. The CB1 receptor antagonist AM251 was applied concomitantly with the wash-out of WIN to ensure complete blockade of CB1 receptor activation. Although robust eCB-LTD was induced in the stimulated path, no significant depression was elicited in the unstimulated path (Fig. 1A,B) (stimulated path, 39 ± 4% of baseline; unstimulated path, 81 ± 9%; n = 5; p < 0.05; unstimulated path vs baseline, p > 0.05). To determine whether more prolonged stimulation of CB1 receptors could eliminate the requirement for activity to induce eCB-LTD, we applied WIN for 20 min and maintained stimulation at 0.05 Hz in one path while stopping stimulation in the other path. Again, eCB-LTD was elicited only in the stimulated synapses (Fig. 1C,D) (stimulated path, 56 ± 5%; unstimulated path, 91 ± 6%; n = 6; p < 0.02). Neither 1 Hz, 5 min stimulation alone nor stopping stimulation for 25–35 min had long-lasting effects on synaptic strength (Fig. 1E,F). The brief decrease in synaptic strength after 1 Hz, 5 min stimulation (Fig. 1E) and the brief increase in synaptic strength after no stimulation (Fig. 1F) could be attributable to several causes, including changes in the readily releasable vesicle pool size or changes in activation of presynaptic metabotropic glutamate receptors (mGluRs). These effects are short-lasting, however, and therefore cannot be responsible for the observed LTD.
Activity dependence of WIN-induced LTD. A, B, Example (A) and summary (B; n = 5) of two-pathway experiments in which WIN (1 μm) was applied for 10 min and followed by the CB1 receptor antagonist AM251 (5 μm). During WIN application, synaptic stimulation was stopped in one path while the other path received stimulation at 1 Hz for 5 min. C, D, Example (C) and summary (D; n = 6) of two-pathway experiments in which stimulation was stopped in one path during 20 min application of WIN while baseline stimulation at 0.05 Hz was maintained in the other path. E, Summary graph (n = 5) of experiments in which afferents were stimulated at 1 Hz for 5 min. F, Summary graph (n = 6) of experiments in which afferent stimulation was stopped for 25–35 min. The experiments summarized in E and F were done on two separate sets of cells. A, C, Sample EPSCs are shown superimposed above the graphs. Thick traces are averages taken during the 10 min baselines. Thin traces are averages taken at 35–40 min (A) and 50–55 min (C). Calibration: 10 ms, 100 pA. stim, Stimulation. We next examined whether, like eCB-LTD induced by the exogenous cannabinoid WIN, synaptically evoked eCB-LTD in the striatum is synapse specific and requires activity after its induction. Both pathways were tetanized using a protocol that has been shown to reliably trigger eCB-LTD in striatum (Choi and Lovinger, 1997; Gerdeman et al., 2002; Kreitzer and Malenka, 2005) (four 100 Hz/1 s trains while holding the cell at 0 mV), and then stimulation of one path was stopped while maintaining basal stimulation (0.05 Hz) of the other path. Similar to the previous results with WIN application, synaptically induced eCB-LTD was elicited in the stimulated path but not in the unstimulated one (Fig. 2A,B) (stimulated path, 78 ± 3%; unstimulated path, 105 ± 7%; n = 6; p < 0.01). These results demonstrate that after the release of eCBs, evoked activity must be maintained to elicit eCB-LTD.
Activity dependence of eCB-LTD. A, B, Example (A) and summary (B; n = 6) of experiments in which both pathways received tetanic stimulation (100 Hz/1 s given 4 times at arrows) to elicit eCB production and release. Baseline stimulation (0.05 Hz) was then stopped in one pathway for 10 min. Thick traces of sample EPSCs are averages taken during the 10 min baselines. Thin traces are averages taken at 40–45 min. Calibration: 10 ms, 100 pA. Many manipulations that influence transmitter release are accompanied by a change in mEPSC frequency, but the effects of CB1 receptor activation on this parameter have been inconsistent (Huang et al., 2001; Robbe et al., 2001). If evoked activity is required for eCB-LTD, application of WIN should not elicit a prolonged decrease in the frequency or amplitude of mEPSCs, because they are recorded in the presence of the Na+ channel blocker TTX. Consistent with the hypothesis that action potential-driven activity is required for eCB-LTD, we found that application of WIN did not reduce mEPSC frequency or amplitude (Fig. 3A,B) (n = 5). WIN does not affect mEPSC frequency or amplitude. A, Sample mEPSCs (recorded continuously in 1 μm TTX) before, during, and after 20 min application of WIN (1 μm) followed by application of AM251 (5 μm). Each panel shows consecutively recorded traces. B, Summary graph (n = 5) showing normalized mEPSC frequency (left) and amplitude (right) during the course of the experiment. Calibration: 500 ms, 10 pA. Although the results thus far demonstrate that both WIN-induced eCB-LTD and synaptically induced eCB-LTD require activity during CB1 receptor activation, they do not address what is provided by the activity nor whether it is presynaptic and/or postsynaptic activity that is required. An obvious possibility is that the depolarization caused by activity results in calcium influx, a ubiquitous intracellular messenger thought to be required for virtually all forms of synaptic plasticity. To test whether calcium influx during CB1 receptor activation is required for eCB-LTD, we removed calcium from the perfusing medium before applying WIN and then added calcium back after the wash-out of WIN. This manipulation prevented LTD (Fig. 4A) (100 ± 14%; n = 4). LTD requires presynaptic Ca2+. A, Summary graph (n = 4) of experiments in which WIN was applied in the absence of external Ca2+. Sample traces (5 min averages) were taken at the indicated times. Calibration: 20 ms, 100 pA. B, Summary graph (n = 6) of experiments in which 10–20 mm BAPTA was included in the postsynaptic recording pipette. C, Summary graph of experiments in which baseline synaptic responses were recorded and then 3 mm kynurenate and 100 μm LY341495 were applied. In one set of cells, WIN and AM251 were then applied (open circles, n = 5), whereas in the other set of cells, WIN and AM251 were not applied (filled circles; n = 7). Calibration: 20 ms, 100 pA. D, Graph from C with expanded axes showing that application of WIN induces LTD even when EPSCs were reduced by ∼95% to 5–7 pA. Sample traces were taken at the indicated times. Calibration: top, 10 ms, 10 pA; bottom, 10 ms, 5 pA. Traces in D are from the same cells as traces in C.
Although the fact that the CB1 receptors critical for eCB-LTD are presynaptic suggests that it is presynaptic activity (and calcium influx into presynaptic boutons) that is required for eCB-LTD, it is conceivable that maintained activity-dependent changes in postsynaptic calcium after the generation of the key eCBs are involved (Pelkey et al., 2005). To test this latter possibility, we blocked postsynaptic calcium increases by including 10–20 mm BAPTA in the recording pipette. 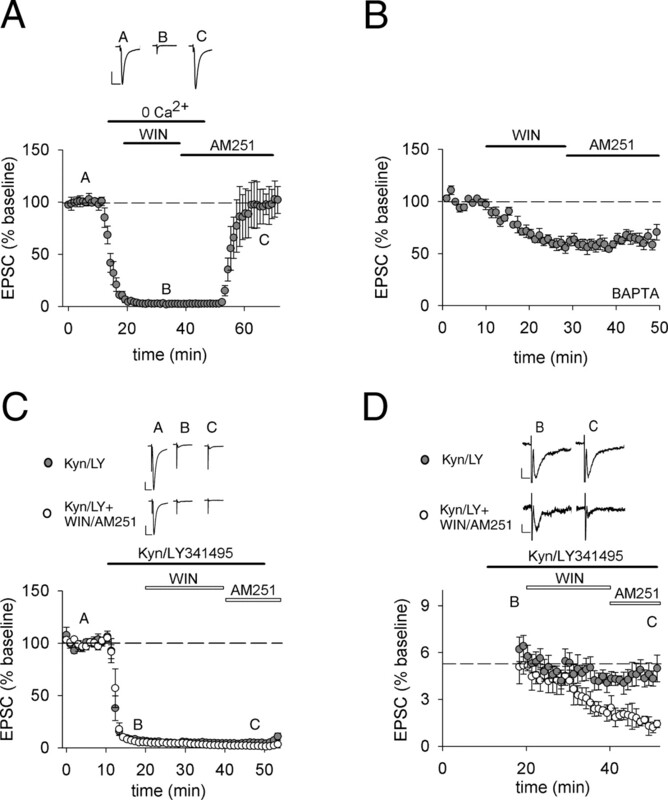 WIN application still elicited eCB-LTD in the presence of postsynaptic BAPTA (Fig. 4B) (64 ± 5%; n = 6), suggesting that any change in intracellular calcium that is required for eCB-LTD after its induction is likely occurring presynaptically. A limitation of these BAPTA-loading experiments is that only the cells from which recordings are made are filled with BAPTA; it is conceivable that maintained postsynaptic activity and the consequent rises in intracellular calcium in adjacent postsynaptic cells are somehow involved in the generation or maintenance of eCB-LTD. To address this possibility, we blocked all postsynaptic glutamate receptors in all cells in the slice using bath application of glutamate receptor antagonists (3 mm kynurenate to block AMPA, NMDA, and kainate receptors and 100 μm LY341495 to block mGluRs) and then examined whether a 20 min WIN application with 0.05 Hz synaptic stimulation (the protocol used in Fig. 1D) still elicits eCB-LTD. This concentration of kynurenate was used to abolish ∼95% of the AMPA receptor EPSC (Fig. 4C,D) and yet still allow measurement of the effect of WIN on the small remaining EPSC, which under our recording conditions is very unlikely to lead to sufficient postsynaptic depolarization to activate calcium sources. WIN application still caused a robust depression under these conditions when WIN was washed out and chased with AM251 (Fig. 4D) (WIN/AM251, 34 ± 4% of baseline; n = 5; no WIN, 89 ± 12%; n = 7; p < 0.01). This result provides additional evidence that it is maintained presynaptic, not postsynaptic, activity that is required for eCB-LTD.
Our results demonstrate that in addition to presynaptic CB1 receptor activation, the triggering of eCB-LTD in the striatum requires maintained presynaptic activity after the postsynaptic release of endocannabinoids. This requirement fits well with the finding that CB1 receptor stimulation for >3 min after the tetanus is also necessary for striatal eCB-LTD (Ronesi et al., 2004). The requirement for presynaptic activity provides a mechanism for synapse specificity by preventing eCB-LTD at inactive synapses even when they are exposed to endocannabinoids that were released as a result of activity at adjacent synapses and cells. Because removal of calcium prevents WIN-induced LTD, and blockade of postsynaptic activity does not prevent eCB-LTD, it is likely that activity-dependent rises in presynaptic bouton calcium concomitant with CB1 receptor activation are required to trigger this form of synaptic plasticity. It has been reported that the CB1 agonist HU-210 [(−)-7-OH-Δ-6-tetrahydrocannabinol-dimethylheptyl] causes a decrease in the frequency of evoked and spontaneous EPSCs recorded in strontium in medium spiny neurons of the dorsolateral striatum (Gerdeman and Lovinger, 2001). However, in these experiments, presynaptic stimulation was used to elicit asynchronous release, and spontaneous events were measured in periods between stimuli. Similarly, the frequency of spontaneous EPSCs recorded with normal extracellular calcium in the dorsal striatum, which by definition are a mixture of action potential-dependent and -independent events, was decreased by WIN application, whereas the frequency of miniature EPSCs recorded in TTX was not (Huang et al., 2001). 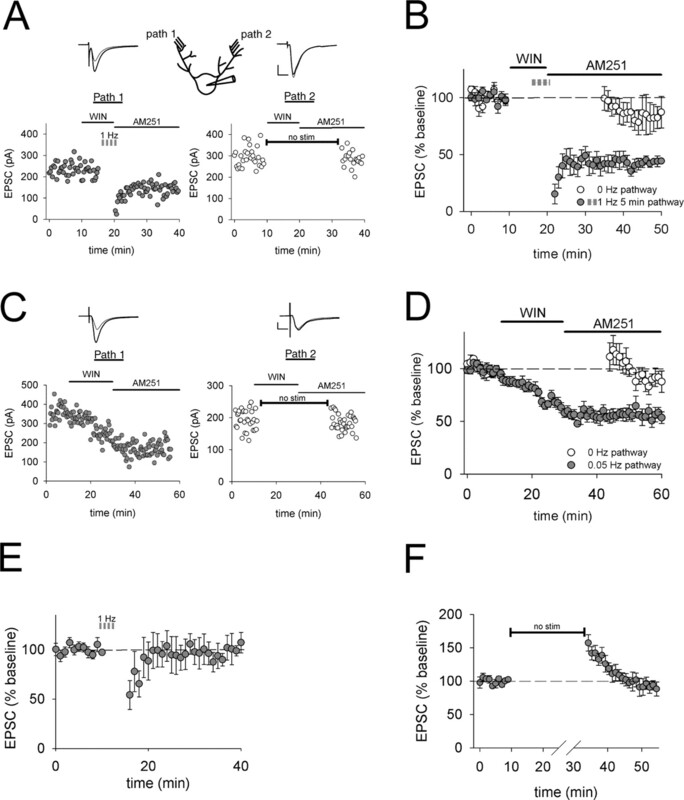 These findings on the effects of CB1 agonists on activity-dependent and -independent synaptic responses in the striatum are consistent with our finding of a requirement for presynaptic activity to trigger eCB-LTD.
A form of LTD at synapses between pairs of layer 5 cells in visual cortex has previously been shown to be dependent on coincident retrograde endocannabinoid signaling and NMDA receptor activity (Sjostrom et al., 2003). However, the synapse specificity of this eCB-LTD was not examined. Furthermore, there are two differences with important mechanistic and functional implications between layer V neocortical eCB-LTD and striatal eCB-LTD. First, neocortical eCB-LTD requires activation of presynaptic NMDA receptors, whereas striatal eCB-LTD does not. Second, neocortical eCB-LTD requires high-frequency activation of presynaptic fibers during exposure to eCBs, whereas striatal eCB-LTD is elicited even when synapses are activated only every 20 s.
A similar presynaptic activity and calcium dependence exists for the eCB-dependent LTD observed at hippocampal inhibitory synapses (I-LTD) (P. Castillo, personal communication). Whether the presynaptic molecular modifications responsible for the long-lasting depression of transmitter release during striatal eCB-LTD and hippocampal I-LTD are identical remains to be determined. Of equal importance will be elucidating the functional and computational roles of eCB-LTD, which according to current learning theories (Brown et al., 1990; Bi and Poo, 2001) should support robust associative learning because of its synapse specificity. This work was supported by grants from the National Institute on Drug Abuse (R.C.M.) and the National Parkinson Foundation (R.C.M. ), a Ruth L. Kirchenstein National Research Service Award (A.C.K. ), and the National Institutes of Health Medical Scientist Training Program (S.S.). (2001) Synaptic modification by correlated activity: Hebb's postulate revisited. Annu Rev Neurosci 24:139–166. (2003) Brief presynaptic bursts evoke synapse-specific retrograde inhibition mediated by endogenous cannabinoids. Nat Neurosci 6:1048–1057. (1990) Hebbian synapses: biophysical mechanisms and algorithms. Annu Rev Neurosci 13:475–511. (2004) Endocannabinoid-mediated metaplasticity in the hippocampus. Neuron 43:1–20. (1997) Decreased frequency but not amplitude of quantal synaptic responses associated with expression of corticostriatal long-term depression. J Neurosci 17:8613–8620. (1997) Neostriatal cell subtypes and their functional roles. Neurosci Res 27:1–8. (2006) Synapse-specific plasticity and compartmentalized signaling in cerebellar stellate cells. Nat Neurosci 9:798–806. (2000) From form to function: calcium compartmentalization in dendritic spines. Nat Neurosci 3:653–659.